Iím a NYC based DJ making international, ambient and dance music in electronic music space, as well as mixing and remixing music for artists. I also have entered the electonic music making arena for commercials, short films and other venues. 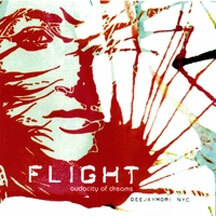 Flight - Audacity of Dreams is my second full length album created and composed by me. Like my first album MEMENTO, Flight manifests my love for eastern melodies, progressive house and Euro techno beats as well as West African drums. In this album I have used up to 45 different beats and melodies in each track as well as introducing eastern vocals to create a special experience and a dream like journey for the listeners. Track 4 Moon Light is my tribute to the late Persian poet Nima Youshij. The voice on this track is of the late Persian poet SHAMLOO. The poem conveys the message of hope amid despair. Track 9 Mano Bebakhsh is my tribute to the young and talented Persian poet MARYAM HEDARZADEH. The voice in this track is of the poet herself. The poem is about a lover expressing and confessing her love in a very sincere way. Track 11 Bezan Berim is the total remix of the song ìBezan Bereemî by very popular Persian Pop artist MANSOR who works and lives in Los Angeles. By remixing this song, i'm trying to prove that Iranian songs with the right mixes have a shot at becoming main street club music. So if you are a DJ, make sure you use this song at your gigs. With so much pain & suffering in the world, I try, even if is only for a few minutes, to bring joy and happiness to my listeners and help them to celebrate and appreciate this very moment. Thanks much for buying this album and make sure you send me your reviews.